The Croats (who were Slavic) arrived in Croatia in the early 7th century. Fast forward to the 16th century, like Hungary, Croatia was taken over by the Ottomans (the Austrians). After World War I, the Croats joined with their neighbours to form the Kingdom of Serbs, Croats and Slovenes. By 1929, a royal dictatorship was introduced and Yugoslavia was formed. After World War II, unlike most of Europe, Yugoslavia was pretty much left alone by both the West and the East. They were communist, but were separate from the Soviets. From 1953-1980 Tito was the president. He's often described as a 'benevolent dictator' which seems like an oxymoron to me, but asking Croats they seem to view him like Marmite - they either love him or hate him. In 1991 Croatia voted for independence from Yugoslavia and a war broke out. Actually Adam and other Croatians we've met refer to this as 'The War'. By 1995 the war was over and they were independent. In 2009 Croatia joined NATO and in 2013 they joined the EU. Adam joked that there are certain places in Croatia that have stayed in the same place geographically, but have been called many different countries. Our first stop was Zagreb Cathedral. We were amused to see that they'd hidden the scaffolding with a photo of what it should look like. Adam revealed that the scaffolding (and photo) had been up as long as he can remember. The cathedral is made of limestone, which falls into disrepair if unpolished. As Croatia was communist for 30 years and as most communists discourage religion, the cathedral was left to fall into disrepair. Adam also revealed that Zagreb Cathedral is the tallest building in Zagreb, and, due to an architectural error, one of the towers is 4cm taller than the other! I like it because it reminds me of the language in Futurama. Outside of Zagreb Cathedral, Adam pointed over to Medvednica -Bear Mountain and told us that Zagreb is the only capital which holds the ski cup! On our way over to our next stop, we learn about Zagreb's relationship with tourism: rewind to six years ago and Zagreb had next to no tourism. Nowadays there is a lot more, and everyone (us included) seems to like Zagreb. Adam thinks it's because people have low expectations of Zagreb and then are pleasantly surprised by it, possibly because Zagreb is clean and safe, has an extremely low rate of homelessness and it's yet to be commercialised. Adam explained that Zagreb was originally two smaller cities: Kaptol (where the cathedral is) and the larger Gradec. Gradec and Kaptol were separated by Medvescak Creek, which has now been concreted over and is a short road with some cute cafes and pubs. The Bloody Bridge once joined Kaptol and Gradec, so called because there was lots of fighting on it! 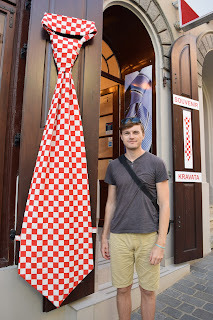 We passed a tie shop, and discovered that Croatia holds the record for the longest neck tie in the world (haha). It measured 808m! The Stone Gate has been around since the 13th Century, and in the 18th Century there was a fire that destroyed everything in/on the gate except for a statue of the Virgin Mary. Croatia being a Catholic country, this was taken as a miracle and people still pray inside the gate today. Read as in, just looked at them - we don't speak any Croatian!! But we noticed a lot of Majkos and Hvalas and we learnt that Majko = mother and Hvala = thanks. Isn't it beautiful!!! I'd actually seen a photo of it before we came to Zagreb, and just assumed it was an average church with a beautiful hologram on it (I have no idea why). So I was surprised to see it was 'real' and made of tiles! I LOVE it! Adam told us that the coat of arms on the right is the coat of arms of Zagreb. 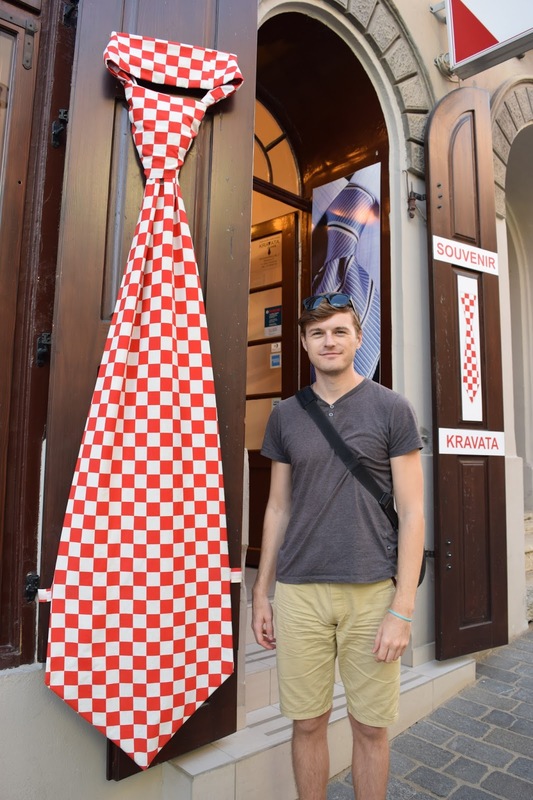 The upper left bit is for Northern Croatia: everyone agrees that red and white have been the Croatian colours since before Croatia was even Croatia, but no one is sure why the chess like pattern is Croatian, it just is. The upper right bit is three heads of the lion/leopard symbolising the three kings of the coastal part of Croatia. Which was right next to Art Park and a cute avenue with lots of art on it! We then went in a creepy tunnel under the city, we liked this bit a lot, apparently they sometimes hold raves in there! After the tunnel it was time for a coffee for me and an ice tea for Tanbay. We had them at Cogito Coffee and they were both delicious. Our final stop was Jelacic Square. This is probably the most famous square in Zagreb and is named after Count Jelacic. You can see a statue of his likeness in the centre of the square on top of a horse. He has a sword in his hand and was originally pointed East towards Hungary (which Croatia hated). During the communist times, Jelacic was branded a traitor, his statue was moved, the square was renamed Republic Square and it became a parking lot. 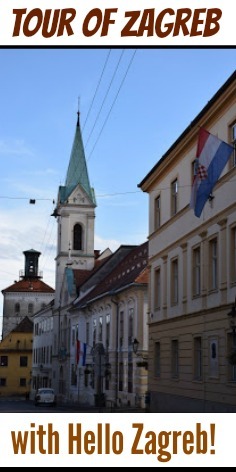 We loved our tour of Zagreb with Hello Zagreb, it lasted about three hours and we went from knowing basically nothing about Croatia, to feeling confident that we now know a lot about its culture and history. Adam was a great guide: informative, funny and lots of fun! To book your own tour head on over to their website hellozagreb.com or find them on TripAdvisor. And to keep up with our own adventures, follow us on Facebook too! Travelling Weasels were invited as guests of Hello Zagreb, however as always all opinons are our own.